Thanks to a generous donation from the local branch of Union Bank, the Housing Authority of the City of Santa Barbara (HACSB) and its nonprofit affiliate 2nd Story Associates recently presented approximately 400 school-age children with backpacks and supplies for the coming school year. 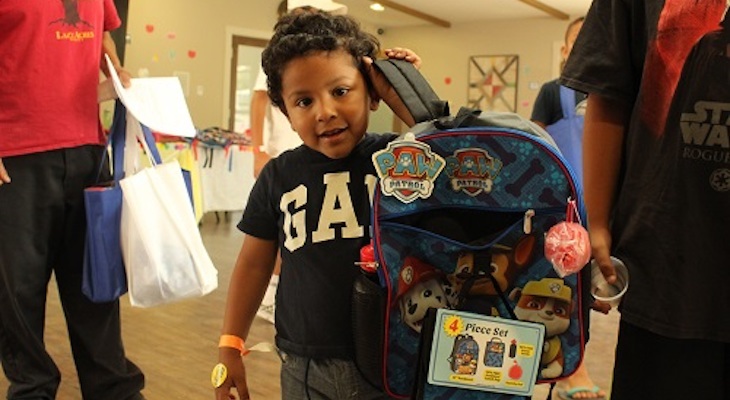 The 5th Annual “Tools for School” at HACSB’s Presidio Springs, 721 Laguna St., brought K-12 students in contact with various local resources for health screenings and education opportunities before sending them off with a new backpack filled with supplies for the school year. While the Housing Authority of the City of Santa Barbara provides innovative housing and services in the community, 2nd Story Associates helps fill gaps to help local families succeed. In partnership with First 5 Santa Barbara, Tools for School made resources available for children five and under. Tools for School is part of 2nd Story’s programs aimed at encouraging academic success and high school graduation among low-income youth through a variety of collaborations and programming. While the event is designed to assist families in preparing their children for school, it also helped families discover the Housing Authority’s youth enrichment programs and other local programs and resources for youth and families. Families were able to visit approximately 20 booths from local organizations, including Scholarship Foundation of Santa Barbara, SBCC Promise, Central Library, Foodbank of Santa Barbara County and many others. The public is invited to make donations to support the “Tools for School” campaign, which helps fund educational materials and supplies such as upgraded computers for Housing Authority’s after-school centers. Donations can be made securely online at http://www.2nd-story.org. Second Story Associates is a nonprofit corporation created in 2007 for the purpose of funding and developing affordable housing and related social services for the benefit of low-income families, seniors and disabled members of the Santa Barbara community, including clients of the City of Santa Barbara Housing Authority. More information at http://www.2nd-story.org. The Housing Authority of the City of Santa Barbara is a local public agency created for the purpose of providing safe, decent, and quality affordable housing and supportive services to eligible persons with limited incomes, through a variety of federal, state, local and private resources. Since 1969, the Housing Authority of the City of Santa Barbara has developed and/or secured over 3,400 units of affordable rental housing for Santa Barbara through a variety of federal, state, local and private funding sources. Please visit the website at www.hacsb.org.